During this two-day, hands-on conference, learn time-tested Real Estate and Marketing strategies used by the country’s most successful Real Estate Investors. Also discover the most exciting, streamlined automation tools to ever hit the Real Estate Investing world… and how to use them to fast-track your investing success! Too many people start wrong and never make it in this business. Start RIGHT by attending this 2-Day Training and learn how to build wealth in Real Estate. Learn How to Invest in Real Estate the Correct and Most Profitable Way! #1 Real Estate Investor Training in Atlanta, GA.
Real estate investor, mentor, and world-renowned real estate investing advisor, Chris Goff, recently announced September 8th and 9th as the set dates for his 2-day 'LIVE' Real Estate Investing Success Conference in Atlanta, GA. This is the summer scheduled conference for 2018, and will have a primary focus on what it takes to correctly execute lease options, seller financing, pre-foreclosure investing and the latest marketing strategies and technology available in today's real estate investing market. Chris has been a featured guest speaker on these topics, broadcast on ABC, CBS, NBC, FOX and in the USA Today. No more boring, lecture hall speakers and program peddlers. Get ready for real education, real networking, real excitement and real success. How to find the deals, where to look, what neighborhoods are best and how to identify these hidden opportunities. How to pay the seller full price and still make money. How to research everything about a property to make wise investment decisions. How to contact the owner, but what to say, when to say it and why real estate investors even saying it. How to inspect a property the correct way, determine costs and why real estate investors shouldn't spend much time doing it. How to make mutually beneficial offers, not just one offer, but multiple offers on every lead and how to get the seller to say yes. How to put the house under contract, the paperwork required, how to fill them out and how to get the seller to sign it. How to secure your deal so the seller doesn't sell to someone else. How to market for buyers, who they are, where they are and how to get them to call. How to use the latest technology to speed up the time-consuming parts of this business. Attendees will experience 2 full days of valuable education, not a 2-day pitch just to get you excited about real estate. Chris Goff is the best at teaching average people to become wealthy in Real Estate with simple, time-tested methods that work in every market, and will be teaching real action steps that can be used immediately. Attendees will be shocked at how simple this business really is, once shown the right steps to take and how to avoid the pitfalls many companies fail to teach. Houston and many other cities are some of the hottest areas for real estate investing, so take advantage of what's happening right at home! As always, Chris is focused on what's important to people struggling with the insecurities of a fluctuating economy - learning how to make money through intelligent investing, and providing financial independence. Chris Goff will be joined by a 4 amazing experts, celebrities and guest presenters. This star line-up will include Best Selling Author and the co-founder of REIPro Real Estate Investor software Bo Manry, former St Louis Rams and Alabama Crimson Tide running back Kenneth Darby, Real Estate Investing tax expert Roger Herring and Top 100 Financial Advisor and Networking expert, Joe Thomas. They will teach the most effective ways to market a real estate investing business, using current, cost-effective online and offline strategies as well as networking skills that will give you confidence to meet your goals. Chris Goff started Real Estate Investing in 1999. Chris didn't have any money to work with, so he was interested in learning 'no money down' strategies. He absorbed any and every bit of information he could find on the subject, and started on his first deal. Chris was lucky enough to break even on the deal, and quickly learned that not all information is good information. Chris continued, learning as he went from his mistakes, and began to see some pretty amazing results. Chris took what he learned from others and combined it with what he had learned by trial and error, to develop a system for investing that would produce as much income as possible, without many of the pitfalls that can be found in real estate investing. In his first 18 months, Chris Goff completed 46 deals with no money down. Chris explained his system to one person; one led to two, two led to four, four led to 40, and working for Donald Trump, writing books, programs, and teaching materials for his Real Estate Education company. Chris learned a valuable lesson while with Trump. Anyone can DO Real Estate, many can SPEAK about it, but not everyone can TEACH it to others. In this, Chris Goff has a genuine gift. The impressive level of success his clients have achieved has resulted in Chris receiving several prestigious awards and accolades in the real estate investing industry. Chris Goff hit five amazon best-sellers lists with the book, "Nothing But Net" with James Malinchak, featured on the Hit ABC TV Show, Secret Millionaire. 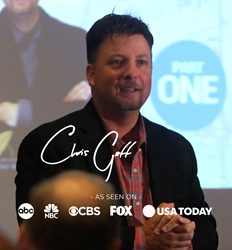 Chris Goff recently hit two amazon best-sellers lists with the new book, "UNcommon" with the legendary New York Times Best-Selling Author, Brian Tracy as well as “The Big Question” with TV and Radio Legend, Larry King. "Chris Goff is one of the most sought-after real estate educators in the country. He has spent his whole life helping others succeed in Real Estate."